Same baseball cap, but VERY different men! PMBComment | The shortest presidential campaign in Latin American history ends today and, God willing, votes will be cast and counted across Venezuela on Sunday the 14th. Who will inherit the messy mantle left behind by Castro-wannabe Hugo Chávez? It is impossible to say for sure. I, for one, am not willing to bet a penny on the outcome of an unusual contest where the 'favorite', Chávez's hand-picked successor, has turned out to be much much much (yes, three times much) worse than we all assumed, while the 'underdog' has sharpened his act - and his political dagger - beyond anyone's wildest expectations. All polls are showing a dramatic narrowing of the gap separating the two candidates. Right after the death of Hugo Chávez, Nicolas Maduro seemed a shoo-in with a 20% sympathy-vote-driven lead over Henrique Capriles. However, the Capriles that stepped into the ring this time is a changed man, with a crisper, more determined approach towards a contest in which he not only has to, yet again, re energize the opposition, but, most importantly, convince undecided voters and low-calorie-chavistas (a.k.a. chavistas lights), that he has the wherewithal to lead (or drag) an off-kilter nation away from its otherwise certain destiny: a bottomless and ruinous precipice. His task has been made somewhat easier by the growing sense that Maduro is, at best, a pirated catalogue of the worst traits of the unburied Comandante Presidente ('todos sus defectos, ninguna de sus virtudes'). 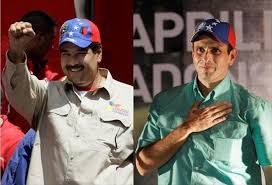 Pollsters - from both camps - now talk about a one-digit gap, with 100% of the momentum in favor of Capriles. This puts us on track for a nerve-racking outcome or something worse. A victory by a narrow margin by either candidate might prove untenable. The incumbent, propelled by the business-as-usual abuse of rules and power and still trumpeting a 20% margin of victory, needs to clear the hurdle by a comfortable margin if the country and the world are to validate this unjust contest as a fair election. Yes, when you abuse the power of incumbency thou shalt deal with incredulity and illegitimacy as a logical reaction. For Capriles the problem is quite different, if victorious against all original odds, he has the unenviable challenge of grabbing hold of - and retaining - the reins of power. The smaller the margin the more formidable the task. That said, I would be willing to bet that a Capriles upset would be followed not by sustained violence but by relief or even the kind of joy that we saw when the Berlin Wall suddenly crumbled or the 1991 KGB-led coup failed in Moscow. However, unbeknownst to all, in this second scenario, unlikely a few weeks ago, there is one huge uncertainty: When exactly would Capriles assume power IF he manages to pull off an upset? Well, nobody knows for sure. The 1999 Bolivarian Constitution is silent on this. It states - as we all know - that elections have to be called within 30 days of a formal ruling on the absolute absence of the President. But, it says nothing about the nontrivial Inauguration that must follows the election. This clearly poses zero problems if Maduro wins; the Inauguration would probably take place as soon as Evo, Daniel and Rafael can haul their respective selves to Caracas (I doubt that Raul would risk making an appearance, but Lula might join in to collect his fees); but it does present a real challenge in the event of a Capriles upset. Too short a transition would be a daunting task, too long a transition a monumental risk. The intention of the framers of our Constitution must have been to resolve this in the shortest possible time. The peremptory period of 30 days for the election reveals that there was a sense of urgency associated with remedying the absolute absence of the head of state. Intentions aside, we will in all likelihood be in the hands of the Court of Supreme Injustice - or worst yet, in the kind of limbo no doctor would prescribe to a highly polarized society. I bring this procedural matter to your attention to highlight yet another early challenge distinct from the oft discussed matters of the economy (in shambles), security (or lack thereof), military (demoralized and fractured), social expectations (undeliverable) and foreign meddling (unacceptably real)...to name but a few of our nightmares in inventory. Some in the Venezuelan opposition have reached the sangfroid conclusion that a Maduro victory is the best outcome as it ensures that the consequences (and the full blame) for the certain macro debacle are borne by those that have mismanaged the affairs of the Bolivarian state. There is a perverse logic to this 'let the guilty foot the bill’ approach. The problem is that it is not just a bus-load of inane, incompetent and corrupt pols, bureaucrats, soldiers and bolicronies that will pay, it will be all of Venezuela that will suffer dearly. Betting on surviving such calamity unscathed is tantamount to jumping from a plane in your Sunday best sans a parachute, i.e. foolish, senseless and not a pretty picture. The reconstruction of Venezuela has to start with the expulsion from power - preferably via the ballot box - of those that have proven over and over to be both incompetent and callous. This does not mean that opposition control of the Executive Branch is going to bring about a magical reversal of fortunes. But with power in the hands of proven derelicts nothing will start to get better, and much would actually get worse. The decline of Venezuela’s fortune started long before the arrival of Chávez - his election was at first a mere consequence of that involution - but, over fourteen years of misrule, Chávez and his cohorts became the cause of problems we would have never foreseen and have yet to be fully understood by the suffering public at large. Mr Maduro’s obvious inadequacies and Mr. Capriles’ surprising resilience have brought us, yet again, to an inflection point to be resolved by the will of the people and the whim of a shamelessly biased electoral tribunal. As in the Constitutional Reform Referendum of December 02, 2007, it will be up to the voters, the students and the institutional elements within the politicized military to ensure that whim shall not trump will. I have a great deal of confidence that if the votes are cast for change, change will win the day whether Fidel Castro and his Venezuelan puppets like it or not.